Loud “kik-kik-kik-kik,” accelerating then slowing. Description: Sexes similar. Grayish-brown back, back feathers with gray edges. 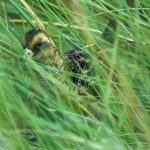 Tawny breast and barred flanks. Long legs, and long slightly decurved bill. 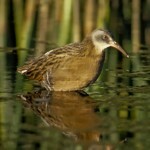 Habitat: Salt marshes with heavy cover, and locally in fresh or brackish marshes. Where in Nebraska: Accidental. Single specimen resulting from a bird captured in a trap during 1951 in Logan County, Nebraska. 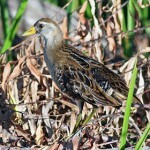 Status: Subspecies California Clapper Rail, Light-footed Clapper Rail, and Yuma Clapper Rail are endangered. 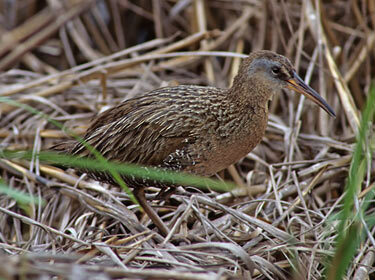 Fun Facts: A group of Clapper Rails is called an “applause”, “audience”, and a “commercial” of rails.